The Rangers will look to stay hot before the All-Star break, playing on home ice for the first time in a week against the Ottawa Senators. Photo courtesy of MSG Photos. After two straight wins, the Rangers (26-13-4) will aim to capture a win in their last game before the All-Star break against the Ottawa Senators (18-18-8). The Rangers will not play again for a full week, meaning they will get some time to rest after playing eight games in 14 days. The Senators fired their head coach Paul MacLean earlier this season, and have struggled to find consistency throughout the season, hovering around the .500 mark for most of the year. Ottawa has also struggled lately, winning just two of their last seven games (2-4-1). Bobby Ryan leads the team in points, with 31 (12-19-31) in 41 games this season, with the captain Erik Karlsson and his booming slap shot not far behind, sitting at 30 points (8-22-30). The rookie Mike Hoffman leads the team in goals with 15, and has 23 total points this season. Hoffman is also a +18, tying him with the Rangers Rick Nash for 10th best in the league. Craig Anderson will start in net for Ottawa tonight, looking for his 13th win of the season. Anderson has been very good this season, posting a 2.33 GAA and a .927 save percentage, indicating his lack of support more than anything. Chris Neil will make his return to the Senators lineup tonight, playing for the first time since December 11th due to a knee injury. The enforcer has seven points (4-3-7) in 28 games this season. After a brief two game skid, the Rangers have won two straight games, both on the road, with the most recent win coming against the Pittsburgh Penguins on Sunday. That win gave the Rangers 15 victories in their last 18 games, outscoring opponents 58-31 in those games. The Blueshirts have won six of their last seven road games. 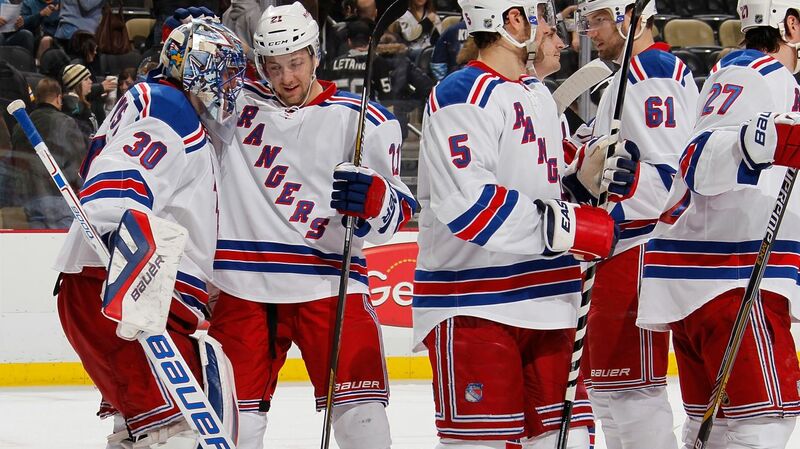 Derek Stepan, who had two goals on Sunday, congratulates Henrik Lundqvist on his 32 save victory against the Penguins. Photo courtesy of Getty Images. New York has played just two games on home ice in the month of January, but will play five of their next six games at Madison Square Garden. 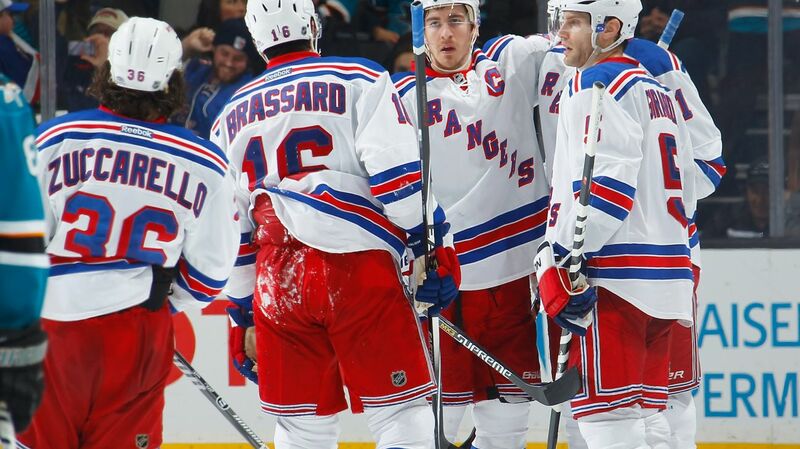 The Rangers are 13-7-3 at home this season, and have won eight of their last 10 games at the Garden. On Sunday, Rick Nash led the Rangers to victory yet again, scoring two goals in the game, and tying him with Tyler Seguin for first in the NHL in goals scored. He also leads the league in games with a goal scored, at 22 games this season. Rick Nash was sensational yet again, scoring his first goal :26 into the game, and adding another one in the second period. Nash is tied for first in the league with 28 goals. Photo courtesy of Getty Images. Derek Stepan also continued his strong play, adding two goals, with one of them coming on the power play. Stepan has been one of New York’s best players since his return, tallying a point in 20 of his 30 games this season (8-23-31). Chris Kreider and Martin St. Louis also contributed with two assists each. Henrik Lundqvist stopped 32 shots against the Penguins, allowing just two goals in his 22nd victory of the season. Lundqvist has won 13 of his last 15 games, and has allowed two goals or less in 12 of his last 14 starts. Tanner Glass was out of the Rangers lineup on Sunday due to an upper body injury, and he will not be available for tonight’s game either. The Rangers are hoping he will be fully healthy after the week off. A huge factor of the Rangers success during the 18 game span has been special teams, which has been rejuvenated since the beginning of the season. The Rangers scored on the power play in Pittsburgh, giving them a goal on the man advantage in seven of the last 12 games (11-31; 29.7%). The Rangers have also been good at killing off penalties, and are 47-54 over the last 19 games (87.0%). 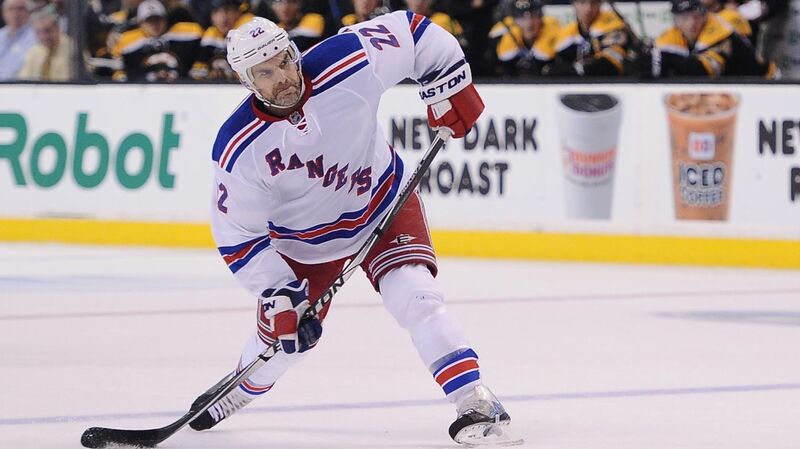 The Rangers have been very strong on the power play as of late, and part of that has to do with Dan Boyle, who has seven of his nine points on the man advantage. Photo courtesy of Getty Images. 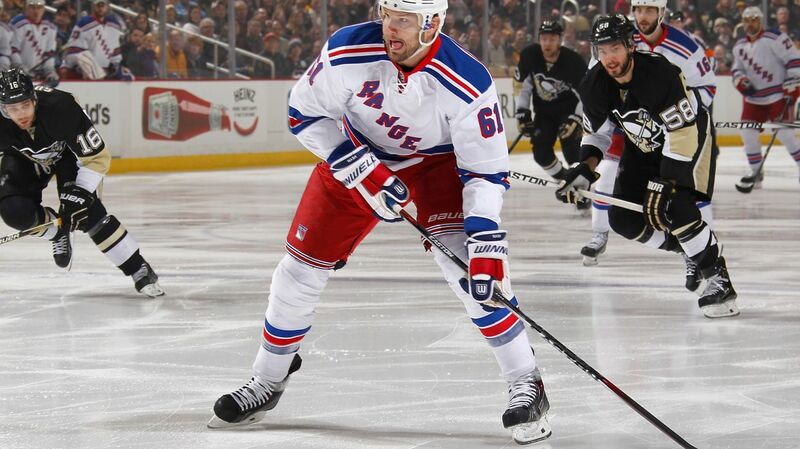 The Rangers and the Senators will face off for the first time this season tonight at 7 PM. The game will be broadcasted on MSG Network. Posted on January 20, 2015, in Game Previews and tagged Alain Vigneault, Bobby Ryan, Cam Talbot, Carl Hagelin, Chris Kreider, Dan Boyle, Dan Girardi, Derek Stepan, Derick Brassard, Dominic Moore, Erik Karlsson, Henrik Lundqvist, Jesper Fast, John Moore, JT Miller, Kevin Hayes, Kevin Klein, King Henrik, Lee Stempniak, Madison Square Garden, Marc Staal, Martin St. Louis, Mats Zuccarello, Matt Hunwick, MSG, MSL, New York Rangers, NHL, NHL 2014-2015 Season, NHL All Star Game, NY Rangers, NYR, Ottawa Senators, Penguins, Pittsburgh Penguins, Rangers, Rangers Nation, Rangerstown, Rick Nash, Ryan McDonagh, Tanner Glass, The Ranger Zone. Bookmark the permalink. Leave a comment.